First there were the Facebook controversies. 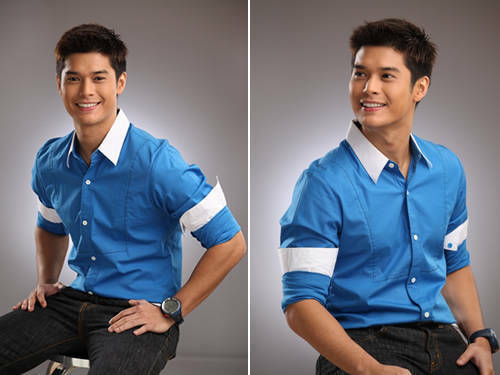 Now, JC De Vera has been "victimized" by a namesake online, this time through Twitter. JC's friends received a shock recently when they read a Twitter account bearing his name that tweeted "pray for me" as he cannot take any "more chemotherapy for my cancer." Hints of suicide were also found in some of the entries. His friend, young actress Ynna Asistio, was one of the first people to read these entries and she then alerted the young hunk. This month's Cosmopolitan Man On Fire, who will return to primetime TV programming via the first ChristmaSerye of GMA-7, Sana Ngayong Pasko, swears that he has neither a Twitter account nor cancer. In fact, JC reportedly only learned how to use the computer and access the internet late last year, since, as he has often confessed, he's a non-techie type of guy. It was only when he returned to school that he was forced to use the computer. Incidentally, JC very recently deactivated his Facebook account.